Most battle royale mobile game lovers know PUBG well. Indeed, they also have the game on their mobile device. The game has been downloaded by more than 50 million players on Google Play Store. Seeing the popularity of the game, Tencent as the developer released an Android emulator so the players are able to play through PC. The emulator is known as Tencent Gaming Buddy and it is still in beta version now. There are several steps you need to follow to install Tencent Gaming Buddy successfully. There is a case that there is a problem during the installation process or stuck. You just need to close the emulator and start to turn off the antivirus. Then, reopen the emulator and click the continue button. Wait until the installation process is done. When the process is done, you may turn on the antivirus. If the first step above is failed, you can do the second step here. 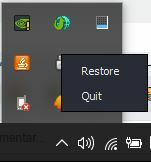 The first thing to do is turn off the antivirus and reinstall the emulator. It takes time than the first step but the chance to finish the installation process is bigger. When the process is stuck in 98%, you may close the Tencent Gaming Buddy emulator first. Just make sure that it has been closed perfectly by checking it on the Hidden Icon menu. Then, click the right mouse on the Tencent Gaming Buddy and choose quit. Now, try to reopen the emulator and click the continue button to continue the installation. If it is failed to install the emulator, you can try one of the steps above again and follow the instruction until you successfully install the emulator and play the game from your PC. You also have to close unused applications which reduce the performance of your PC. By following the steps above, you are not only can play PUGB from your mobile phone but also from your PC. It is a great option if you often bring your PC anywhere and anytime. Tencent Gaming Buddy is also an option for those who love to play PUGB on a big screen instead of on the small screen. ****. Who will waste 1.2gb again to download this game. Overall TENCENT GAMING BUDDY SHUCKS. MY APP ALOS NOT LOADING YET… EVERY TIME ITS’S STOP 98% COMES??? WHY???????????????????????????????? SAME ERROR WITH MY LAPTOP………..
same issue did you get the solution? Click on the link to watch the video my problem has got solved………very useful…..
Just open multiple window from left side button.